We’re excited to share this great news with you! We received the official word last week that Avontage won funding awarded by American Express Venture Challenge at ASU Venture Devils Demo Day. This is confirmation of our vision, and the movement we are creating, to enhance our local business community. Our team is more motivated than ever, after much hard work, to bring to life Avontage as an innovative marketing tool for the local business owner. “To have industry experts and seasoned visionaries give us the vote of confidence and thumbs up is an extremely humbling experience and a great motivation for our team,” said Sean Sarram, CEO & Founder of Avontage. 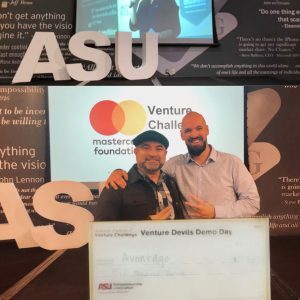 Thank you to the ASU Venture Devils team, American Express Ventures, the judges, our mentors, advisors, members, customers, and everyone who believed in our vision. 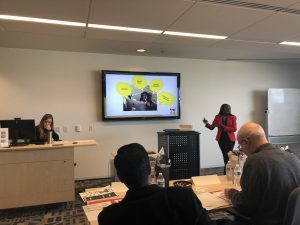 Small business owners and freelancers are the backbones of our economy and in today’s world, they have to compete with multi-national corporations and brands to earn customers and followers. We believe democratizing the local business marketplace, and putting the simple tools in the hands of the business owners to market themselves, will give our local community a huge advantage. Our communities’ advantage is in the numbers. Over one hundred million people in the U.S. call themselves a small business owner, freelancer, entrepreneur or influencer. We want to connect them in every local community so they can collaborate, help each other, and grow their own businesses, rather than helping the global brands and corporations grow theirs. We want you to join our movement too. Today the local small business owner has to waste thousands of dollars on marketing and advertising that most times doesn’t work. Another option is to list your services on sites such as Groupon. The problem is they force you to discount your services by at least 50 percent and then they take half of the remaining as their fees. So essentially you’re constantly running 75 percent off sales in the hopes of gaining quality and returning clients. Unfortunately, that promise has not been delivered. The results are hurting the merchants, changing the consumer behavior for the worst, and causing a race to the bottom. Merchants and local business owners are not happy with these solutions. And that’s why we created the Avontage marketplace. On Avontage, merchants, local business owners, restaurants, freelancers, digital marketers, creatives, or anyone with a talent or a skill, can list their special Offers for FREE. Members of Avontage can trade and exchange their services during slow times to save cash and gain each other as clients. Our members are in full control. They choose what special Offers they list and they set a limit on how much to trade per month. Additionally, our members can sell their Offers to the public and accept all major credit cards. Avontage will be open to the public and will provide tremendous exposure for your business at no cost.